Jukodo Yoshikuni (active. 1804 - 1843) Nakamura Shikan II as The Nursemaid Komori, 1827. Oban. A rare and important print from one of the leading Osaka artists. The print is from a series of five pieces that each show Shikan in one of five different roles from a dance performance Rangiku Tsuyu no Adamakura. The print predates the typical stylistic middle period of Osaka art. The distinctive drawing of the actor is evident and is a precursor to the more familiar mature style of Yoshitaki and Hirosada. 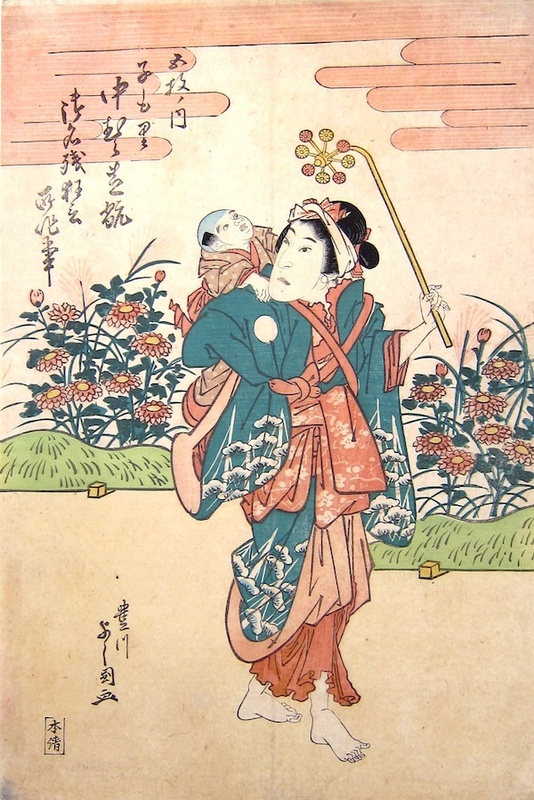 The colour is delicate, archaic in feel and from traditional pigment rather than Edo dyes of the later period. The format is unusual in the genre - the chuban came to be the primary size of the ukiyo prints of the Kamigata region - but this retains a debt to the prevailing Edo size and overall design. The delicacy and lightness of touch in the piece is outstanding as is the directness of the draughtsmanship and the simplicity of the forms. The piece reveals a candid stagecraft - the wedges used to support the backdrops on the stage are clearly visible in yellow at the base of each landscape section; and note the Edo inspired shorthand for clouds which is borrowed from Hokusai. The nursemaid carries a small child on her back; the strange object in her hand is a child’s windmill or pinwheel. The print commemorates Shikan’s performance of the five role dance piece, Rangiku Tsuyu no Adamakura in Osaka in October 1827 (called a hengemono). More even than Edo, Osaka was a centre for coteries of artists, amateur poets and kabuki enthusiasts. It was these small groups that drove the development of printmaking and culture. Yoshikuni was a critical figure in one such group: The Jukodo Poetry and Print Circle. This important group of artists, poets and theatrical figures would commission works, and collaborate together. Some were theatrical producers, some playwrights and this coterie of enthusiasts is similar to the Surimono traditions of Edo, where wealthy patrons would commission beautiful and extravagant pieces in limited editions from leading artists of the day. This oban print is in perfect condition, it is full size, a fine impression, good colour with no damage. The complete series is in the collection of The Museum of Fine Arts Boston. Signed Toyokawa Yoshikuni ga, published by Honsei.